The ClassicCut Lite Series guillotine trimmers are a great choice for occasional general-purpose cutting needs. The lightweight design makes it easy to transport from desk to desk. Perfect for trimming bond paper, cardstock, construction paper, photos and customized presentations. Self-sharpening steel blade cuts up to 10 sheets of 20 lb. paper. Durable, plastic construction makes it lightweight and easy to transport. Additional features include a protective rail guard and a blade latch hook. Alignment grid and dual scale ruler for precise measuring. Choice of 15" or 12" cutting length. Limited ten-year warranty. I bought this product ten plus years ago, it still looks new except i need to see about replacing the blade. Welcome to MyBinding video. 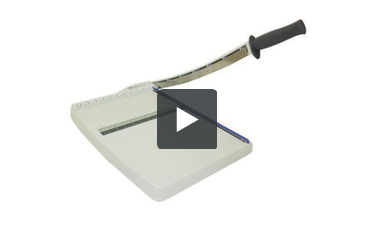 Today we're looking at the Swingline ClassicCut Lite 15-inch guillotine-style paper trimmer. ClassicCut Lites are designed for the occasional use and the need to move around the office or take with you. The storage lock is nice and secure, however, a bit tricky to undo. It will take both hands to open. The alignment grid is both US and metric and the blade is sharp to keep nice, straight cuts. ClassicCut Lite can cut up to ten sheets of 20lb paper per trim. The 15-inch blade and oversize work table allows for larger and oversize documents. The super light weight makes the ClassicCut Lite 15 an easy transport. For more demos, reviews, and how to's on this product and many more, check out MyBinding.com. The 15" Classic Cut lite is a medium use paper trimmer from Swingline with some nice features for the price. Here's a quick look at some of this machine's strengths and weaknesses. One of the best features of the 15" Classic Cut Lite, is, in fact, its extremely light weight. It is made of a plastic that appears to be extremely durable, but that also makes the machine light and easy to transport from room to room either around the office or your home to wherever you want to use it at any given time. Usually we are not the biggest fan of plastic construction, but Swingline seems to have dome their best to ensure that this machine will last a long time. The cutting capacity of 10 sheets of 20lb stock is pretty decent for such a small machine too. This trimmer also does a very good job when you are working with heavier stocks such as bond paper, construction paper as well as card stock and photographs. The blade of the 15" CC Lite appears to be very well constructed, and designed to last you a great many years. It is set up to sharpen itself as it is being used, so unless you go all crazy and decide to start cutting wire with it, the blade could very well last for the life of the machine. There are some nice safety features on the 15" CC Lite as well. The blade can be latched down when the machine is not being used or when is is being moved around, and there is a sturdy guard rail on the table that keeps fingers well away from the cutting blade when it is in action. One other nice feature of the 15" CC Lite is the handy alignment grid that includes measurements in both the metric system and in standard US measurements. This helps you greatly in making sure that your cuts are precise, accurate, and properly aligned. The "15 inch cutting length makes cutting letter and legal sizes a breeze, and you will even be able to trim larger custom sheets up to "14 in length if necessary. The ten year warranty is a nice feature as well. It is a good sign that Swingline is offering this length or warranty, as it shows that they have a lot of faith in the abilities of this machine as well. The cutting capacity of the 15" CC Lite is more than adequate for occasional trimming jobs that are up to medium volume. If you are working for a larger organization, however, or one that processes large amounts of paper on a regular basis, you are likely going to want to get a machine that can cut more sheets at once than this one can. Though the overall build of the machine appears to be solid, it is mostly plastic after all, and is thus going to be inherently less durable than a wood or metal machine would be. This shouldn't be too much of a problem, however, if you are careful to operate within the machine's capacity. Do they make a replacement blade for Swingline model #9315? Unfortunately, no the manufacturer does not produce replacement blades. The blade is self sharpening and should stay sharp as it is used and can be resharpened once or twice.